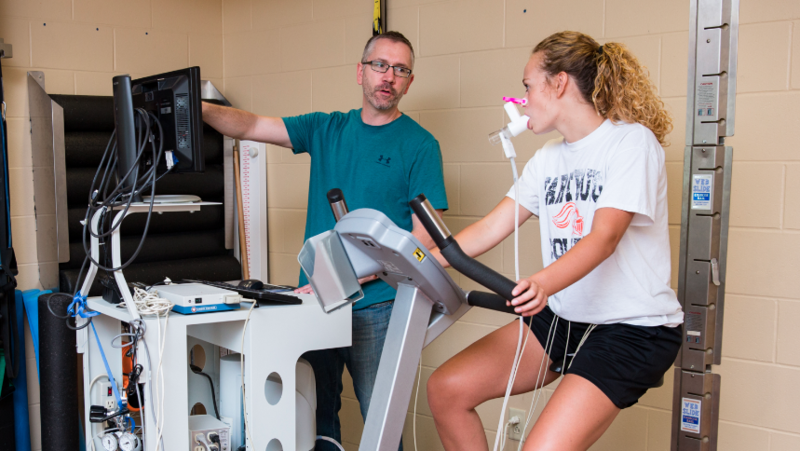 Dr. Ed Westen, Wartburg’s new director of the Department of Health and Physical Education, monitors the cardiopulmonary functions of Emma Gerdes, a sophomore from Cedar Falls, during an exercising stress test. Wartburg College’s newest major combines the school’s long tradition of success in health sciences with its dominance in athletics to create a program that will help fill a growing demand in a wide range of health-related fields. Exercise science is the newest major to be added to the Department of Health and Physical Education, which will be now be chaired by Associate Professor Ed Westen. The addition of this major was among the nearly 60 recommendations that stemmed from the Focus on the Future task force, which was charged with exploring opportunities to help guide the college in the coming years. The timing also was right, as several other colleges and universities opted to change or discontinue related programs on their campuses after the Commission on Accreditation of Athletic Training Education established that a master’s degree was needed for entry into the field. Westen said Wartburg’s track record for providing the undergraduate education for students who go on to graduate school in the health sciences made this major a natural fit for the college. Students earning an undergraduate degree in exercise science could go on to study athletic training or physical therapy in graduate school, attend nursing or medical school, or further study one of the core areas in exercise science in graduate school. Those seeking immediate entry into the workforce can find opportunities in commercial, community, corporate and clinical health-fitness facilities. “We are excited to offer Wartburg students a top-quality exercise science education that will prepare them well for graduate and professional study or for employment in this growing field. This program is a perfect fit for our experience in health-science education and for our unrivaled success in collegiate athletics,” said Brian Ernsting, vice president for academic affairs and dean of the faculty. In the first year of the program, exercise science students will take many of the same courses as students in the college’s renowned biology program. In the second year, the programs will start to diverge when exercise science students will begin taking more courses specific to their major, including human nutrition, a new two-term human anatomy and physiology course, advanced exercise physiology, exercise testing and prescription, kinesiology and a “current topics” course. Exercise science students will not be required to take the two research courses required by other science majors, though it will be strongly encouraged. “Overall, this will look a lot like our other science majors, with students taking two science courses and a lab along with two essential education courses or a requirement for their minor each term,” said Westen, adding that students in the new major would be able to participate in any of the co-curricular or study away options the school offers and still graduate in four years. During this academic year Westen will be responsible for chairing the search committee charged with hiring a faculty member specializing in exercise science.